Location: South side of Renacre Lane. Shaws Garth now ruins through the station site. Present state: Demolished the site has been developed for housing but a plaque marks the stations location. Notes: Shirdley Hill station was situated on the Liverpool, Southport & Preston Junction Railway (LSPJR) Barton Branch that ran between two junctions with the West Lancashire Railway (WLR) on the east side of Southport to Hillhouse Junction on the Southport & Cheshire Lines Extension Railway (S&CLER), just north-west of Altcar & Hillhouse station. The station was close to the centre of the small settlement of Shirdley Hill on the south side of a level crossing. of the station building and adjacent to it was a two-storey house for the stationmaster and, on its north side, a further single-storey building that housed toilets. On the down platform was simple waiting shelter. Goods facilities were located south of the passenger station, east of the line. The facilities consisted of two sidings that could accommodate 32 wagons. A Railway Signal Company timber signal box with a 12-lever frame was located to towards the south end of the station, west side of the line; it controlled traffic movements through the station and access to the goods yard. There was a crossover and a connection from the up main to the goods yard immediately south of the box. At the north end of the ‘down’ (Southport direction) platform was a two lever Railway Signal Company ground frame, operated by a member of the station staff, which controlled the level crossing. Initially six trains ran in each direction between Southport Central and Altcar & Hillhouse but, owing to insufficient use, the service was reduced to four trains in each direction. From May 1888 the WLR operated through services between their Preston terminus and the Cheshire Lines Committee (CLC) Liverpool Central station. The trains ran via Shirdley Hill, but it is not known if they served the station. Through goods services also ran between the CLC and the WLR via the Barton branch. In December 1895 there were weekday departures from Shirdley Hill for Southport Central at 8:32am, 2:27pm, 5:27pm and at 9:22pm. To Altcar & Hillhouse there were trains at 7:21am, 12:53pm, 4:41pm and 8:01pm. There were also three trains in each direction on Sundays. The LSPJR and its sponsor, the WLR, struggled financially from the start and were insolvent by the 1890s. Despite grand plans both had become nothing more than local lines which, unfortunately, ran through sparsely populated areas for much of their length. As a result both companies were absorbed into the Lancashire & Yorkshire Railway (LYR) on 15 July 1897. On 1 May 1901 the LYR closed Southport Central and diverted the Barton line trains into their Southport Chapel Street station. They also ceased to operate through trains between Preston and Liverpool Central. They did gain running powers over the SCLER up to Aintree, but it appears that very little traffic actually ran that way from the Barton branch. box with a gate wheel for working the level crossing. On 1 January 1922 Shirdley Hill station became part of the London & North Western Railway (LNWR) after they absorbed the LYR. 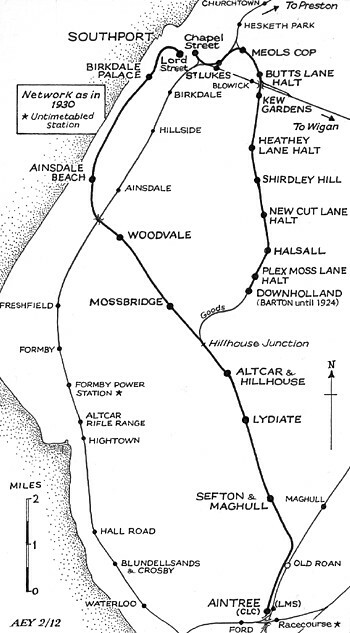 The July 1922 timetable showed ten weekday departures from Shirdley Hill for Southport Chapel Street, four for Altcar & Hillhouse and six for Barton. The following year the LNWR merged with other companies to form the London Midland & Scottish Railway (LMS). With effect from 13 November 1926 passenger services were withdrawn to Altcar & Hillhouse and all southbound services terminated at Barton, which had been renamed Downholland on 2 June 1924. In summer 1932 the LMS operated ten weekday services to Southport Chapel Street and ten in the return direction. The first departure from Shirdley Hill was for Downholland at 6:58am and the first departure for Southport Chapel Street was at 7:17am. The last Downholland service was at 9:38pm and the last Southport departed at 9:57pm. Since the railway opened there had been no significant growth of housing along its route beyond Southport, and the mosslands remained thinly populated. During the 1930s competition from local buses had a detrimental impact on the number of passengers and, as a result, the passenger service was withdrawn completely on 26 September 1938. The last train ran on Saturday 24 September 1938 and was operated by a conventional locomotive and coaches. The last stationmaster at Shirdley Hill was Thomas Shaw; by the 1930s he superintended all of the stations on the line. the level crossing gates. In 1945 Shirdley Hill box was closed and replaced with a ground frame - the box remained standing until 1960. The line from Butts Lane Junction through Shirdley Hill to Downholland was converted to ‘one engine in steam’ regulations using a round, black single-line staff. On 1 January 1948 Shirdley Hill became part of the nationalised British Railways (London Midland Region). British Railways withdrew the goods service on 21 January 1952 and closed the line completely from the north side of the level crossing to Downholland although the track remained in situ until the early 1960s. From the north side of the Shirdley Hill level crossing to Butts Lane Junction the line remained open as a double-track storage siding which merged as a single track at Shirdley Hill. Buffer stops were placed at the end of the immediately north of the crossing; the track left in situ to Downholland was physically severed from the storage sidings. Until August 1963 the sidings stored excursion stock that had run to Southport. 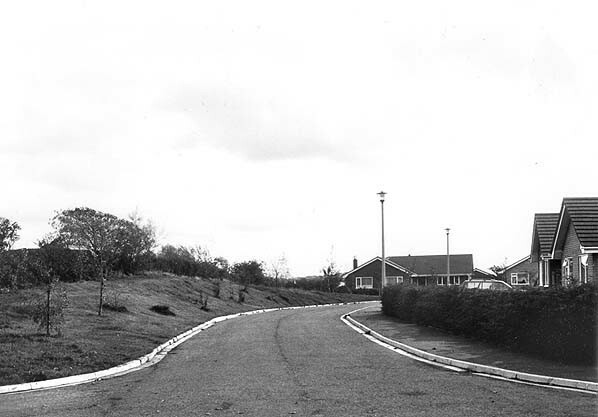 The line between Butts Lane and Shirdley Hill was lifted in July and August 1964. The Shirdley Hill station site was later developed as a residential area named Shaws Garth after the last stationmaster. As part of the development a plaque was installed to show that the site was once Shirdley Hill station; it was observed in situ on a site visit on 3 January 2006. Tickets from Michael Stewart, Bradshaw from Nick Catford and route map drawn by Alan Young. 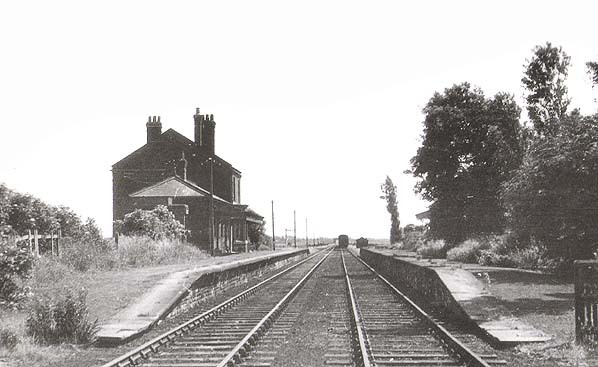 Shirdley Hill station, looking south from the level crossing in 1949 eleven years after it closed to passengers. Copyright photo from Stations UK. 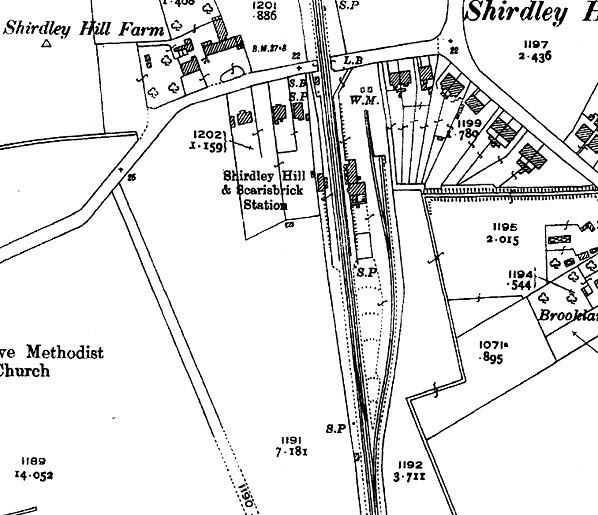 Shirdley Hill Station as shown on a 1893 map. 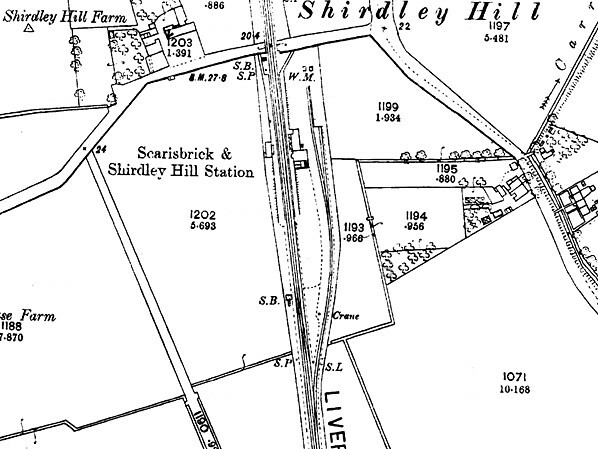 Shirdley Hill Station as shown on a 1928 map. 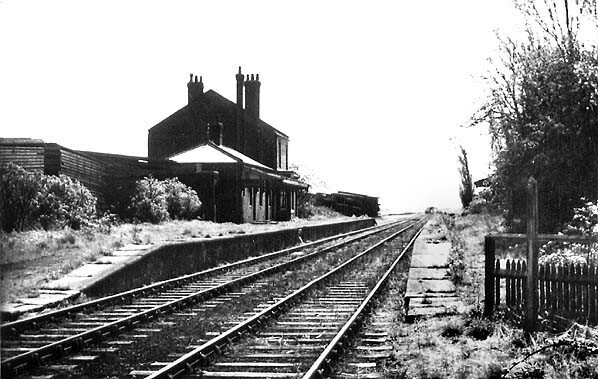 Shirdley Hill station, looking south in 1954 after all services had ceased. The track remained in situ at this location until 1963. The site of Shirdley Hill station, looking south in October 1982 from a point that would have been on the level crossing, north of the station. 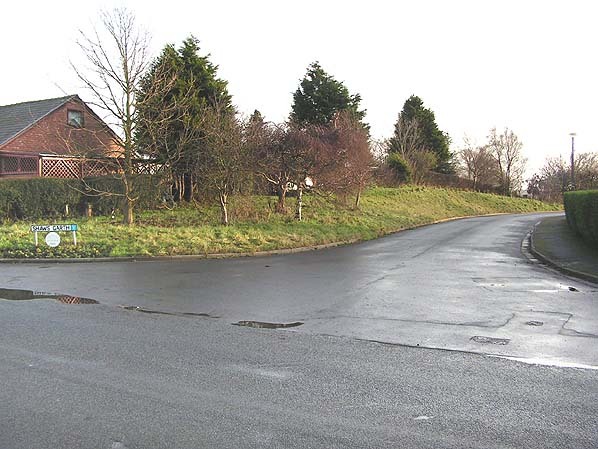 The site of Shirdley Hill station in January 2006. The viewpoint is similar to that in the picture above. Plaque at the site of Shirdley Hill Station. 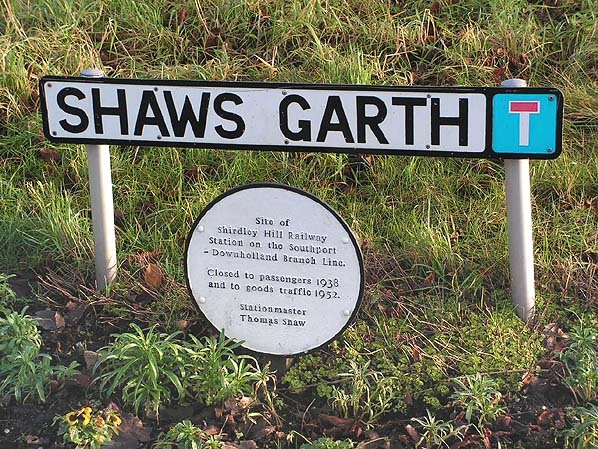 The road Shaws Garth is named after the last station master Thomas Shaw.